Reignite Love Dating Tips & Strategies: VALENTINE'S DAY: Should You Celebrate Valentine's Day? If you wish to win the woman you're attracted to (but won't admit, even to yourself), do NOT neglect to send her SOME TOKEN OF YOUR FEELINGS on Valentine's Day. Roses are a good way and a hot favorite to convey your feelings even if you cannot just yet tell her outright or if the moment is not quite right yet. Do nothing and it might convey INDIFFERENCE (on your part)! Sentimental, mushy stuff? Maybe, but that is the nature of Romance 101. It's not the size of the gift but rather the intention of the act and the thought (and feelings, or lack of) that drives the intention and the action. We don't care if it is just one stalk of rose, one bar of chocolate...anything (NOT just digital stuff, and definitely not just a text)...except NOTHING! You won't be forgiven if she was secretly hoping you would declare or unveil your feelings...a little at least, especially if you've been together for several months! But please, no vacuum cleaners, cake mixer, kitchen/house stuff, especially if you've been together for a long time. If that is what she wants, fine but please include something romantic as well and pamper and spoil her a little...V-day comes just once a year! Definitely don't take her for granted. If you can afford to take her out to dinner, great, but if you can't there are some good Valentine recipe books and ideas for Valentine's dinner that you could tackle in the kitchen and surprise her with your (newly-acquired?) culinary skills. (Find Valentine cook-books and free recipe ebooks here). If you really care about this woman you will find that this act alone will result in huge romantic dividends. But if you can't commit your feelings for her after a reasonable length of time together, perhaps it's time to be upfront with her and move on? If he still has not committed his feelings to you after a few months together check this out to see how you can change the situation so that he falls helplessly in love with you (again?) - either that or consider moving on. You don't really want to waste years of your life with someone who reaps the benefit of your presence (and treats you like a fall-back girl perhaps?) but will not reciprocate your romantic feelings and commitment in kind - there is no relationship future in that. You can get strong clues as to what he really thinks about you by the way he treats you on your milestone dates: Valentine's day, birthdays, anniversaries etc., and the way he behaves towards you generally. Love and relationships are not dis-similar to gambling - you don't know the outcome, but you take a chance anyway; you think it's worthwhile for the risks you take and you make that leap in faith...whatever the future brings... Sometimes it pays off, sometimes it does not. When it does not work out that's when you have to decide on your course of action. 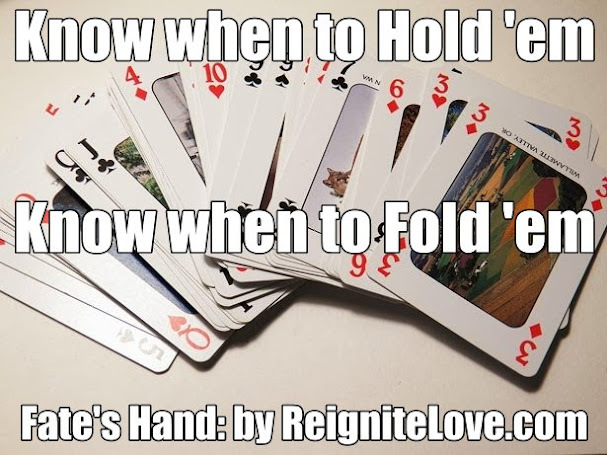 Wise and responsible players know when to hold 'em, when to fold 'em, when to walk away and when to run. It's easier to make better decisions if you believe: "You owe it to Yourself to live the Best Life you can!". You may not agree with everything we say here but hopefully you'll find an ace that you can keep? If you do not have major issues with your love life, congratulations! Paint the town red on Valentine's Day and enjoy yourselves for you are blessed indeed. "Life isn't about roses and sweets, but sweets and roses are about Life!" 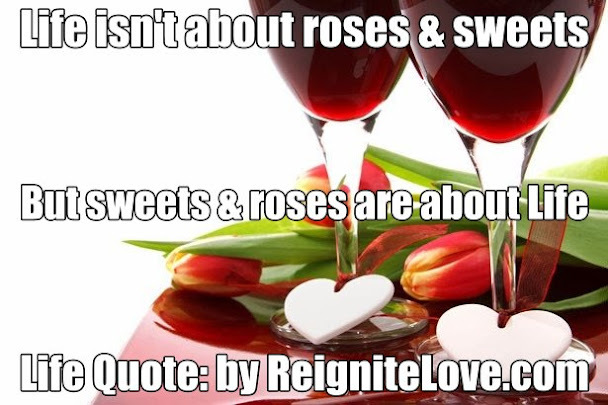 - This is an original quote created by Reignitelove.com, 2 February 2014. BTW 'The Gambler' by Kenny Rogers is one of Oprah's favourite songs and ours too. It's a privilege to have access to this wonderful, Youtube resource and we hope this will continue forever - enjoy!